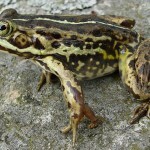 The pool frog was first identified in the year 1973 and this diverse species is generally found in several parts of Europe. Moreover, this beautiful green colored frog is misunderstood with other categories of the frog kingdom. The tadpoles of the pool frogs are much larger than their rival species. The adult and tadpole usually prey on grass snakes. Although the adult snakes are one of the best predators. In some parts of UK the species are endangered and fighting for their existence. Moreover, it is forbidden by laws to pet these species. Size: Well they are of different shapes and sizes. Usually the length varies between 2.5 to 3 inches. Infact the size of the female counterpart are more than that of the males. The size of the tadpole pool frog varies from 5mm to 9 mm. On an average an adult Pool Frog has a length between 75 to 90 mm. 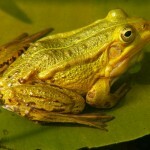 Color: Pool Frogs are found in different colors like olive green, brown. Even their body has dotted dark brown colored spots. Infact, there is a yellow color line bifurcating the dorsal side. Their eyes are embellished with golden hue and the belly is off white in color. 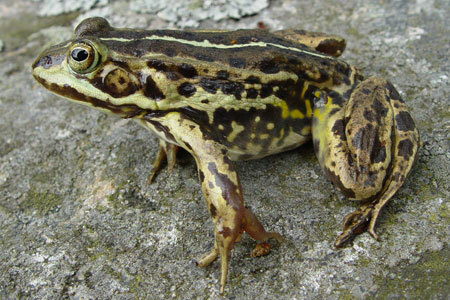 Head: The pool frogs are devoid of any kind of dark flecks round their ears just like other frogs. Eyes: The eyes are no doubt beautiful with horizontal pupils. The pool frogs are mainly found in the parts of Europe that includes the countries of France, Austria, Germany, Italy, and Netherlands etc. In addition to this, the pool frogs do inhabit parts of United Kingdom and adjacent areas of Scandinavia. 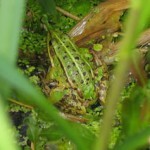 The pool frogs usually like to inhabit in small water pools where the sun can penetrate the ground. They always like to have the place fortified with woodlands. Infact, they also dwell in lakes, ponds, swamps and meadows. Moreover, the water dwellers are also found to be floating on the flowers and leaves. 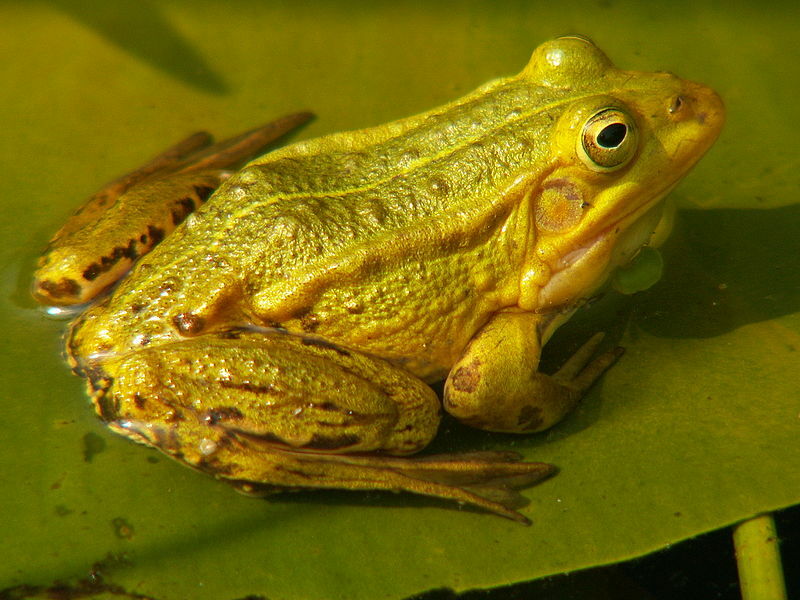 One would find the pool frog in and around water bodies and sometimes, they are also found in a typical depression created during the time of ice age. The pool frogs those are adult they are carnivorous. They feed on different types of insects, wasps, and dragonflies’ etc. In fact they also thrive on other amphibians. The smaller ones generally like to have algae and other type’s flies. These species generally boast of some extraordinary behavior compared to others. These creatures are mainly diurnal and they remain active even during the daytime. Infact they thrive better on hot weather. One of the strangest habits of this species is that they like to relish the hot sun. This is not natural amongst other category of frogs. Even they hide in the pools when they feel insecure and have apprehensions in their mind. When they fall into a loop or comprehend some kind of danger, they call out for fortification. They can also travel for long distance for catching their prey. They can live well with humans without any irritation. They have a wonderful sixth sense they can sense every single move of their predators. Their body colors help them to camouflage on the ground. In this way, they are refrained from being preyed. They have a very good swimming ability, which help them to save from contenders. 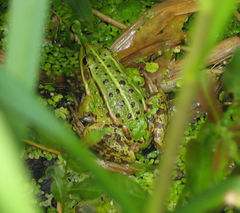 Usually pool frogs experience their mating season in the month of May to the end of June. 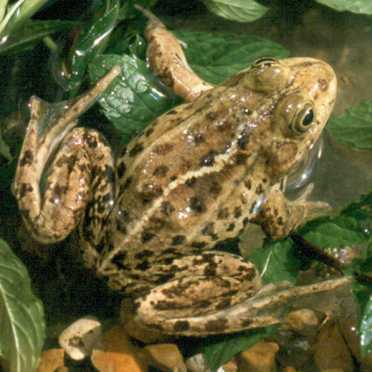 The mating of the pool frogs usually takes place after the period of hibernation. Overall, time is 2 to 3 years. The male counterpart calls aloud to attract the female ones. Usually they lay 500 to 4500 eggs in swamps, ponds and other marshy areas. Then the fertilization of the eggs takes place. The tadpoles transforms into frog lets between August and September. Actually, these water dwelling species hibernate between months of September to November. In the colder regions, they usually hibernate from March to May. They can sleep anywhere; it may be under the tree, or the ground surface anywhere. According to the IUCN report, these species are grouped in the category of least important.